A hosting firm designed for web developers, internet marketers, and professional webmasters, Eleven2 offers dedicated servers, virtual private servers, reseller hosting, and shared hosting plans. Our positive initial judgment — based on the purchase process, choice of data centers, ease-of-use, and a number of industry best practices — produced high hopes for our Eleven2 hosting experience. While our Dotcom Monitor testing did produce a 100% reliability rating, it also indicated less-than-impressive server speeds. On balance, Eleven2 has earned 4 stars and the NCM Online designation of RECOMMENDED WITH RESERVATIONS. Eleven2 offers four shared hosting plans with 1-year term pricing that ranges from $4.95 up to $32.00 per month depending on the package selected. All four shared plans feature a choice of three datacenters (USA, Europe, Asia); the CloudFlare content delivery network; free website transfer; free daily backups; cPanel control panel with Softaculous applications installer; unlimited e-mail accounts, forwarders, and auto-responders; 24×7 technical support; 99.9% uptime guarantee; and a 60-day money-back guarantee. Designed for beginners, the cheapest shared hosting plan, S-100, renews at $4.95 per month for a 1-year term, includes all common features indicated above, as well as 10GB of disk space, 50GB of monthly bandwidth, and the ability to host up to 10 domains on a single account. Designed for hosting small-to-medium sized websites, the S-200 plan renews at $8.00 per month for a 1-year term, includes all S-100 features while adding 250GB of disk space, 20,000GB of monthly bandwidth, and the ability to host unlimited domains on a single account. Configured for ecommerce sites, the S-300 plan renews at $16.00 per month for a 1-year term, includes all S-200 features while adding 500GB of disk space, 40,000GB of monthly bandwidth, a free SSL certificate, and a free dedicated IP address. 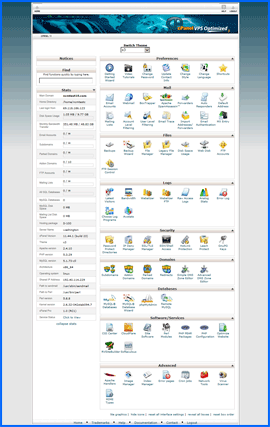 Screenshot of Eleven2 cPanel control panel. Click to enlarge. Eleven2‘s most advanced shared hosting plan, the S-400 is ecommerce ready and designed to accommodate larger, well-trafficked sites. The S-400 renews at $32.00 per month for a 1-year term, includes all S-300 features while adding 999,999GB of disk space and 999,999GB of monthly bandwidth. In keeping with web hosting best practices, all Eleven2 shared plans utilize the cPanel website control panel (screenshot right) and the Softaculous applications installer. Available applications and tools include (WordPress, Drupal, PrestaShop, Joomla, phpBB, AbanteCart, SMF, WHMCS, MyBB, Magento, and many more. In addition to shared hosting, Eleven2 offers four reseller hosting plans, three VPS (virtual private server) plans, and four dedicated server plans. As is our practice, we selected the cheapest available plan, the S-100, for purposes of testing and review and proceeded to checkout. 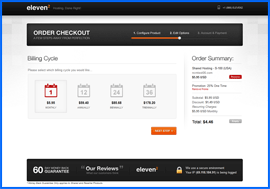 Eleven2 utilizes a simple, consumer-friendly, four-step checkout process. The first step is to select a datacenter from a choice of three: (USA, Europe, or Asia). As seven of the thirteen Dotcom Monitor testing locations we utilize for speed and uptime testing are located within the United States, we clicked the USA button and proceeded to step 2. We then entered the primary domain name to be associated with the account and proceeded to step 3. Screenshot of Eleven2 Billing Cycle selection page. Click to enlarge. Step 3 provides a choice of four billing cycles: $5.95 monthly, $59.40 annually ($4.95 per month), $85.68 biennially ($3.57 per month), or $178.20 triennially ($4.95 monthly). We have no idea why it should cost more to prepay for three years rather than two, but we have provided a screenshot of the Billing Cycle selection page at right. As we only require the hosting account for testing and reviewing, we selected the monthly billing cycle and proceeded to step 4. Billing and payment information are entered in Step 4. Unlike too many other low-cost web hosting services, Eleven2’s account and payment screen is a model of consumer-friendly best practices. There are no unwanted, added-cost options automatically added to the shopping cart. The price you see in the order summary is the price you selected on the billing summary page. Further, there are no pricing asterisks on the page — the price you selected is the same as the renewal price. Eleven2 Uptime Test Results Chart. Click to enlarge. We entered our account information, selected the PayPal payment option, agreed to the Terms of Service, and clicked the “Complete My Order” button. One minute after receiving our PayPal receipt, the “New Account Information” e-mail arrived in our inbox. It included everything required to quickly set up our NCM test site. Next, we set up our Dotcom Monitor page-load speed and reliability testing, and waited for the test results data to accumulate. All web hosting services reviewed by NCM Online are purchased and subjected to our 10-day test for reliability and speed. Eleven2 testing began on 11/27/14 and concluded on 12/6/14. We are pleased to report that Eleven2 maintained a perfect 100% reliability during our uptime testing. See screenshot above right. Eleven2 Speed Test Results Chart. Click to enlarge. 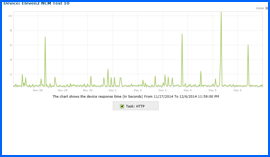 Unfortunately, the page-load speed test results were disappointing. Eleven2 recorded a decidedly mediocre 10-day average speed of 1.6873 seconds to load the simple, one-page NCM test site from 13 locations worldwide, and 1.1645 seconds from the 7 U.S. locations. See screenshot right. While we would not classify Eleven2 hosting as slow, based on our otherwise positive experience with the host, we were disappointed they had not scored better. See speed testing results chart right. Rated B+ by the Better Business Bureau, Eleven2’s shared web hosting plans are backed by a 99.9% uptime guarantee, a 60-day money-back guarantee, and 24/7 technical support. Three-year billing plan costs more per month than two-year plan. Designed for first-time webmasters as well as web professionals, Eleven2 remains a good hosting choice. However, if page-load speed is crucial to the success of your website, there are faster shared hosts. Eleven2 has earned 4 stars and is recommended with reservations by NCM Online. Cheap website hosting company price comparisons based on 1-year term list price before coupon/promo codes or limited time/introductory offer discounts. These are the renewal rates for the second year of hosting. To ensure that you receive the most affordable Eleven2 pricing possible, please visit our Web Hosting Coupon Codes page for current discounts and special offers before making any purchases. *Prices based on 1-year term before the application of coupon/promo codes and introductory/limited-time offer discounts. While you may pay less for the first year of hosting, the prices displayed on this page are the 1-year term renewal rates. The founder of Eleven2 (E2), Rodney Giles, transformed his webhosting company idea into a reality at a Texas Starbucks during the fall in 2003. Eleven2 grew out of that idea into a company that’s goal was to offer dependable hosting services and premium customer support. Rodney developed this webhosting company from its small town roots to currently host more than 100,000 websites as an international business. He continually develops the E2 team’s skills with training to further advance the direction and vision of Eleven2. Eleven2 intends to stay active in the industry through constantly improving the methods they use to cater to their customers’ needs, as well as, the international community’s needs. The company’s main headquarters are located in Houston, Texas. 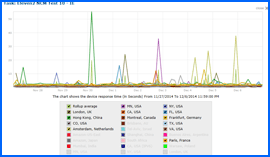 Additionally, servers and offices are also based in London, England, Singapore, Asia and Dallas, Texas. These provide the resources capable of satisfying all demanded hosting needs. Eleven2’s webhosting services are high-quality and affordable. The company is staffed with business owners, designers, musicians, developers, filmmakers, photographers, writers, and many more. They are able to boast that they can best understand their customers’ needs and deliver on them because they are just like those they serve. The company is not like many of their competitors in that they make a point to invest all their time and interest into their customers. Eleven2 feels that these roots have promoted them to their current success as they continually grow and expand. The philosophy of treating customers as individuals is something the company would like to institute into the world of webhosting. Eleven2’s affordable hosting services offer premium features, hardware, uptime, and support. This enables customers to get the best value while using their technology dollars. The company is so intent on this customer pleasing philosophy that they ensure satisfaction with their webhosting or they guarantee your money back. The company has no intentions of selling out after being established. Eleven2 focuses on their financials staying debt-free and being fiscally responsible. These methods help ensure the company is stable for years to come. Company staff can be contacted by e-mail, chat, or phone at any time of day, every day of the year. This video tutorial demonstrates the installation of WordPress on a Eleven2 shared hosting account using cPanel and the Softaculous 1-click applications installer.